Showing people that female journalists are not going to step aside. Sexual harassment, threats, attacks, government oppression, a stubborn glass ceiling, unequal pay, accusations of fake news and a growing mistrust of the media all threaten press freedom around the world. And female journalists often bear the greatest brunt of these attacks; the number of female journalists killed in 2017 more than tripled from 2016. 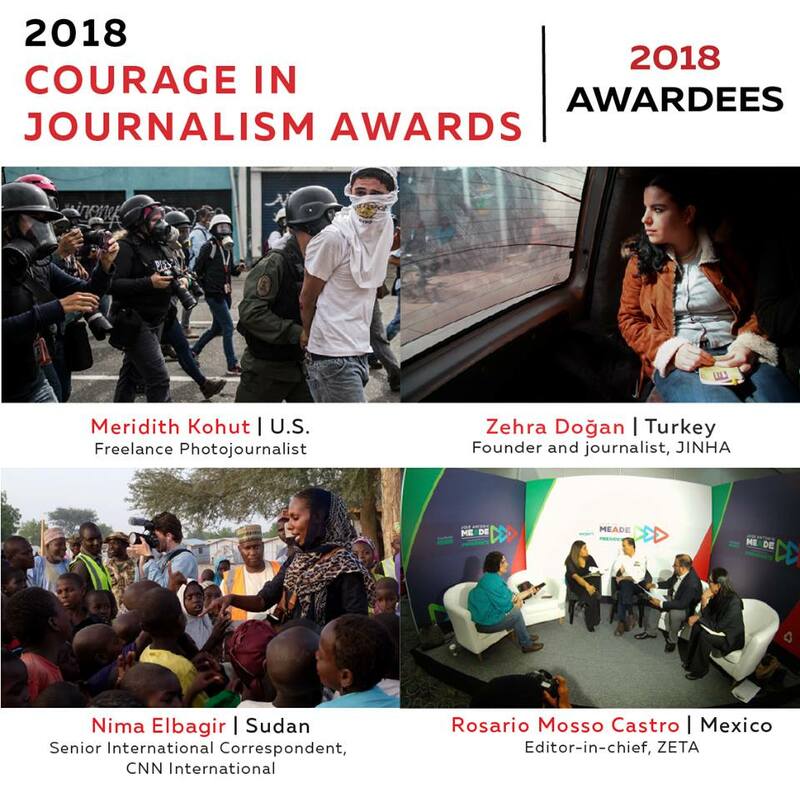 The International Women’s Media Foundation’s ‘Courage in Journalism Awards’ show people that female journalists are not going to step aside, cannot be silenced, and deserve to be recognised for their strength in the face of adversity. It honours the bravery of journalists who report on taboo topics, work in environments hostile to women and share difficult truths. 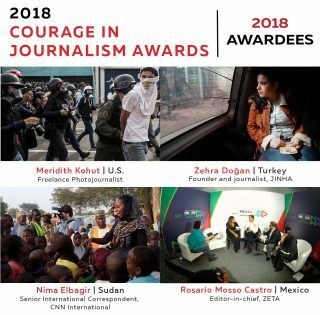 This year, the International Women’s Media Foundation (IWMF) is honouring four female journalists with the 2018 Courage in Journalism Awards and a long-time trailblazer in the industry with the Lifetime Achievement Award. Nima Elbagir’s talent for getting into closed-off warzones is so impressive that she has repeatedly been the first or only foreign journalist to gain access to certain areas. In November 2017, her undercover reporting in Libya showed migrants being sold at slave auctions, and prompted a response from governments across the world, including in Libya and at the United Nations. Zehra Doğan began her career in journalism as one of the founders of Turkey’s first all-women news agency JINHA in 2010 which was shut down by a government decree in 2016. In 2016, Doğan was arrested for “membership in a terrorist organisation” and sentenced to 33 months in prison. While in jail, Doğan has shown true commitment to journalism – and has collaborated with fellow inmates and created a newspaper made entirely by hand. Rosario Mosso Castro, editor in chief at ZETA newspaper, a weekly investigative publication and one of Mexico’s most targeted media for their reporting on crime, has led journalistic investigations against criminal organisations such as the Sinaloa cartel, the Arellano Felix cartel and the Jalisco New Generation cartel, and focused on the relationship between drug traffickers and authorities in Baja California. Despite the risks of working in one of the most dangerous countries for journalism, and even after the murders of colleagues, Castro has shown a profound commitment to journalism. Meredith Kohut, an American photojournalist based in Caracas, Venezuela, is often the first or only photographer to shoot in-depth photo essays on taboo subjects that regularly put her safety at risk. Despite being targeted by the government and experiencing physical harm at the hands of government actors, Kohut refuses to leave Venezuela. As a freelance photographer, she has produced in-depth photo essays about the drug trade in Bolivia, Cuba’s transition, and refugee and migration issues in Central America, among others. And this year’s Lifetime Achievement Award has recognised Lesley Stahl, a broadcast journalist, and CBS’s first female White House correspondent, with a long and admirable career filled with political scoops, surprising features, award-winning foreign reporting, who has been a 60 Minutes correspondent since 1991. Each year, IWMF honours female journalists who report against all the odds. Using the timeline feature on the IWF’s new website you can now search through the years to see all the incredible women who have been recognised for their determination, bravery and accomplishments.